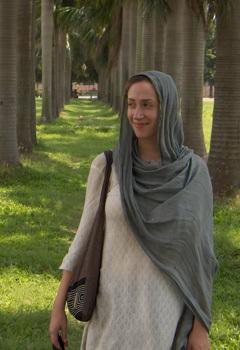 When Bridget Kustin ’05 enrolled at Whitman College in the fall of 2001, her chief goal was “to move beyond my suburban Los Angeles upbringing.” Four years later, the Whitman English major and debate champion had journeyed all the way to Bangladesh as a Fulbright research fellow. In truth, Kustin left her Southern California comfort zone long before she earned a Fulbright award. In her junior year at Whitman, she lived and studied in Jaipur, India, through the school’s Study Abroad program. “Most of my academic work . . . has centered around South Asia, gender and post-colonialism, and I’m excited beyond words to be able to apply that knowledge to field research,” Kustin said when news of the Fulbright award reached her. Kustin came to Whitman as a Claire B. Sherwood Scholar. She was eager to form “intellectual connections” with her peers and teachers. She wanted to learn firsthand about the natural world after so many years in the urban bush of the San Fernando Valley. And she was keen to participate in competitive debate. As a senior, Kustin and fellow student Scott Thompson came within a point of winning the National Parliamentary Debate Association Championship for duos. More important, she and Thompson helped Whitman claim its first national debate title in the season-long sweepstakes competition. Competing in the final round of the national finals was but one of several personal achievements for Kustin in four years at Whitman. She was a presenter at an environmental education conference in Maine; a volunteer for trail restoration in Colorado; and the author of a far-reaching honors thesis in English on postcolonial literature written by South Asian women. “Each thing represents fairly divergent aspects of my personality,” she said. The Fulbright Student Program, for which Kustin created her own project, is the flagship of educational exchange programs in America. Established in 1946 by U.S. Congress, it allows students, scholars and professionals to undertake international graduate study, advanced research, university teaching, and teaching in elementary and secondary schools worldwide. Kustin’s goals have only multiplied since she received a Fulbright. She wants to be fluent in at least four languages besides English: Bengali, Hindi, French and Spanish. Because of her broad experience in the development sector of Bangladesh, she expects to work with a consulting agency or think tank in the near future.